I just subscribed to Wizz Air's Discount Club to save some money on fares. Normally, whenever I begin any kind of paid subscription, I instantly unsubscribe to avoid being charged again on an unwanted renewal. ...and I didn't see anything in the terms about automatic renewal. 1) Will "unsubscribing" from the Wizz Air Discount Club cancel the remainder of my subscription? 2) If I don't unsubscribe, will my membership automatically renew? If I don't unsubscribe, will my membership automatically renew? 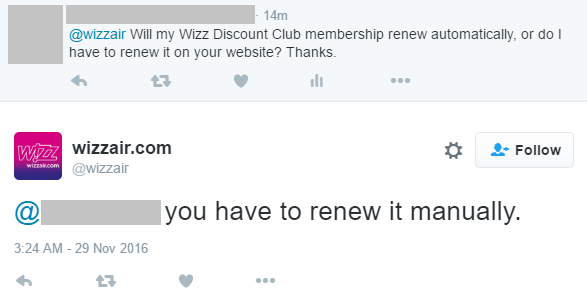 Will "unsubscribing" from the Wizz Air Discount Club cancel the remainder of my subscription? Their updated website no longer has the option to unsubscribe from Discount Club membership, so the question is moot. Not the answer you're looking for? Browse other questions tagged wizz-air payment or ask your own question.